The Fourth of July and fireworks are traditional in the US, and go together like hamburgers and hot dogs. And, as thrilling as it is to watch fireworks, care should be exercised because the sound pressures generated by fireworks can lead to hearing damage if proper precautions are not employed. Ancient China introduced fireworks, but they have a special place in American history as well. In 1776, just after the Declaration of Independence was approved by Congress, John Adams, the second US President, wrote to his wife Abigail that America’s independence ought to be solemnized “with pomp and parade, with shows, games, sports, guns, bells, bonfires and illuminations, from one end of this continent to the other, from this time forward forever more.” By illuminations, he was referring to fireworks. Public fireworks, though not typically heard up close, are still explosions and can be very loud. In recent years the number of “quieter” fireworks have increased for consumer fireworks, with 120 dB noise limit on all consumer fireworks, and the amount of flash powder (chemical that produces the loud bangs) reduced (European Union). Looking at the list of fireworks sold as quieter items, these have whistles or crackles instead of bangs. However, for large fireworks displays, if one is looking for something spectacular – quiet and spectacular do not mix. The reason is because “spectacular” is achieved by large bursting effects that create a lot of noise. Of course, the level to which one may be exposed to high noise levels depends on the location of the observer from the fireworks, and the type of fireworks. An open environment is better than an environment surrounded by large buildings, especially if they are close to the point of explosion. In this case, the sound can bounce from one building to the next, sometimes enforcing the sound. Sound in an open environment is dissipated more readily. The further one is from the fireworks, the lower is the overall sound level, making it less likely that the levels will affect hearing. But, how far away should one be for protection? 1. Estimate distance. Upon seeing the “flash” of the fireworks, count the number of seconds until you hear the “boom” associated with it. Sound in air travels at approximately 1100 ft/sec. 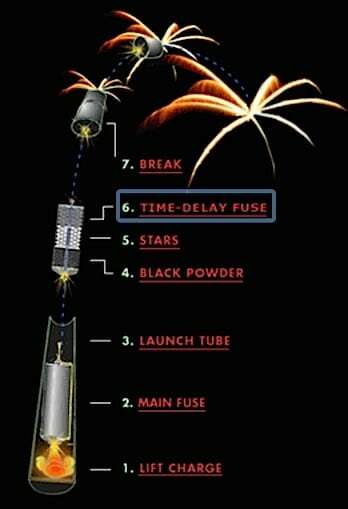 In the example below, if the time between seeing the flash until you hear the blast is 3 seconds, you can expect the distance from the fireworks sound source is 0.6 miles. 2. Estimate sound level. Assume this is a large public fireworks display and that the fireworks at 10 feet is a sound level of 150 dB SPL. This is a “guesstimate” level based on a number of current published measurements. Keep also in mind that more recent fireworks makers have been working at “softer” fireworks levels. If you were a half mile away, the sound level would be 102 dB SPL. If the measured sound level is less than 150 dB, each successive halving of the distance lowers the overall sound level 6 dB. 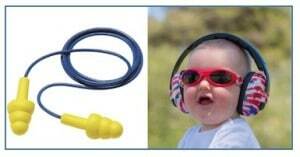 Wear earplugs or headphones/earmuffs to protect hearing, especially that of children. For children, ear protection can have an additional advantage – the child will be less frightened by the loud sounds. Multiple styles of hearing protection are readily available at any sport shop or from a hearing professional, but for children, headphones may be the best choice because they are more likely to remain in place. The packaging of any hearing protection should indicate the NRR (noise reduction rating). The higher the number, the better the protection. It is unlikely that you will find hearing protection with NRR ratings above about 30 dB, meaning that they are stated to reduce the noise level by 30 dB. It is important that earplugs fit into the ear canal properly to provide the maximum protection promoted on the package. This exercise assumes that you have a sound level meter that measures impulse noise (which few individuals would have, unless you have it on an app for your smart phone). Measure the sound level at say 80 feet (or some other distance to get a meaningful measurement). 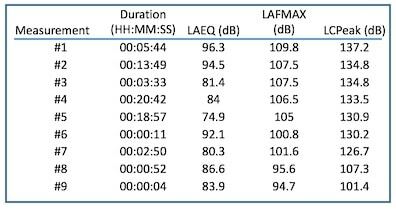 The example uses a sound level of 90 dB at that distance, for the firecracker measured. 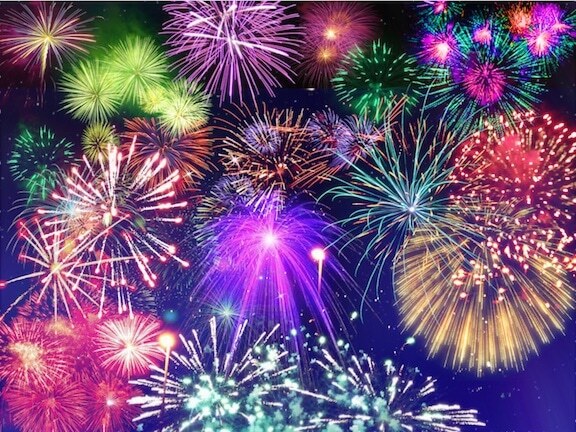 Different fireworks can be expected to have different sound levels. Add 6 dB for each halving of the distance until you get the distance the firecracker would ordinarily be used. In this example, if you wanted to use it at 10 feet, the level would be 108 dB SPL. 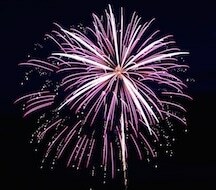 Fireworks for home purchase are not necessarily safer than big public fireworks events. They tend to not have such high sound levels, but because you set them off yourself, you are likely to be closer to the sound source, and as such, perhaps to a higher dose of noise. So, if purchasing your own fireworks for home or neighborhood use, you might choose those that create the biggest visual effects, not the biggest boom. These non-scientific measurements were made at 10 feet (3 meter) using a SLM (sound level meter). Because the SLM settings were not specified, a visual of the SLM used suggests that the measurements were made to measure impulse peaks on the C scale. Most of those listed consisted of sparks and whistles. Sadly, this is likely to include most people. A most common complaint is that one might have a ringing or buzzing sensation in the ears (tinnitus), which can be a symptom of hearing loss. Another complaint is that of a shift in hearing sensitivity – toward poorer hearing. This could be temporary or permanent. If any of these conditions occur, or if a sudden change occurs in understanding at distances greater than three feet (words seem muffled), consult a hearing care professional to have your hearing evaluated. 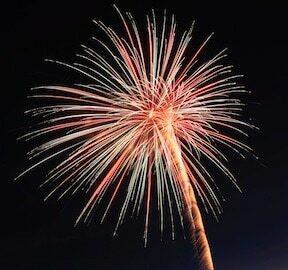 Why Do Fireworks Make Noise? A firecracker is activated by lighting the fuse, which burns, and reaches a point where it sets off a chemical reaction of hot gas when the powder is ignited. The gunpowder is confined in a hard paper tube, meaning that the gas explodes, rather than being released harmlessly. This propels the contents up the tube. The loud popping sound occurs when the chemical burning reaction releases the gas. This is similar to the process in a bullet fired in a gun barrel. Why are some fireworks blue, others red, green, orange, etc.? The answer lies in the chemicals layered in the fireworks. Blue sparks are produced by copper, red is created by a mix of salts and other substances (lithium and strontium), green by barium, orange by compounds containing calcium, and yellow by sodium. Bright white colors require that the chemical reactions burn at a very high temperature.